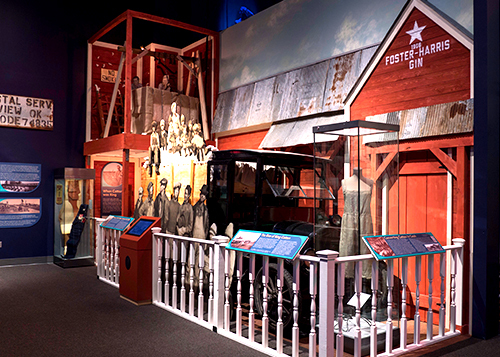 The Oklahoma History Center’s Crossroads of Commerce exhibit is a dynamic walk through Oklahoma’s economic development divided into five time periods. 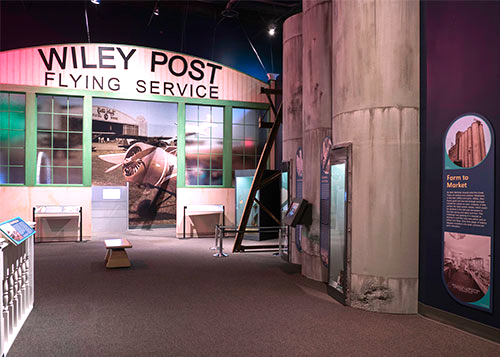 Each area displays the changing stage of history, the individual stories of entrepreneurs, and companies that have etched their names and faces into many of our memories, such as Sonic, TG&Y, B.C. Clark, WKY, and the Oklahoma Thunder. Visitors of all ages will learn more about the businesses of our state, as well as reconnect with the memories of the businesses we remember from our childhood. The greatest challenges to entrepreneurs looking for opportunity on the Oklahoma frontier included distance and isolation from capital and markets, inefficient transportation and communication, weak institutions, and the rapid migration and diversity of people moving into and through the region. Those businessmen who “conquered distance” found a way to succeed. With better transportation, communication, institutional structure, and access to capital and markets, the primary raw materials for economic development came from the ground in the form of crops, livestock, oil, and other minerals. Economic activity was driven by those who “added value” to those raw materials and created a ripple effect that supported service industries. As the Oklahoma economy escaped limitations as a regional source of commodities, competition on the bigger stage demanded not just hard work and adding value but also a more sophisticated business structure that balanced capital, production, and marketing. Those who “applied innovation” through creativity, efficiency, and sustainable business models supported the economy during a prolonged period when falling prices for crops, livestock, and oil created hardship in rural Oklahoma. As the national economy shifted from industrial production to consumption, those entrepreneurs who succeeded "chased consumers" beyond their local communities to the state, regional, national, and international markets. Whether those consumers were baby boomer families on vacation or art collectors in Santa Fe, Oklahomans found a way to reach out in creative ways. After suffering through one of the most dramatic dips in a roller-coaster series of “booms and busts,” Oklahoma’s economic recovery was boosted by newfound opportunities based on race, gender, ethnicity, home-grown culture, and public-private partnerships. By "embracing diversity," women, immigrants, American Indians, and native-born Oklahomans opened new doors of opportunity for everyone and recognized the value of giving back to their communities.